New to web hosting? Not sure where to start? You're in the right place, my friend. Below is our basic guide to web hosting, taking readers like you step-by-step from intro level to advanced in mere minutes. Step 1 Complete: Level Up! Which Hosting Type Do I Need? Step 2 Complete: Level Up! Step 3 Complete: Level Up! Step 4 Complete: Level Up! Step 5 Complete: Level Up! Learn what hosting is and why you need it. In a nutshell, hosting consists of a computer that hosts a website. That’s it! A web host is just a computer! Nicely done. You are awesome. Most of the options that come with hosting relate to the options of the computer itself and we will explain these options in the following sections. To help you along your journey to Web Hosting Expert is our site’s official mascot, Hosty. Each section you complete, you will help build Hosty part by part and reward him with cool new abilities. You have made it through the first step. Well done! That wasn’t too bad, was it? Next up: let’s discuss why you shouldn’t try to host a website yourself. Next: Why Do I Need Hosting? Yes, you could, but that would be a really bad idea — I mean really bad. There are many reasons web hosts exist and their low cost and high performance make them affordable for everyone, not to mention headache-free. Below we’ve listed some reasons hosting a website at home is nearly impossible. Power Outages – If your power goes out at your home, your website will go down. Slow Connection – While you may have very high-speed Internet at home, this usually only relates to download speed. With a server, since you are sending files, you need a high upload speed. It is almost guaranteed that your home connection has a slow upload speed. Dynamic IP Address – Your home Internet connection has a dynamic IP address that changes over time. This is like your house address constantly changing and people trying to send you mail. It makes it nearly impossible. Hardware Maintenance – If your home computer has any issues or needs a new part, it could be days or weeks before your computer is running again, and all of that time your website will be down and you may even lose your files. Redundant Power Supplies – The power supplies at most web hosts are almost always backed up by on-site generators that keep sites live even in extreme power outages. Ultra-Fast, Stable Connections – Web hosts have extremely fast upload speeds and can serve hundreds, thousands, or tens of thousands of concurrent visitors easily. Static IP Address – With a web host, you can have a dedicated IP that will never change. This means your address always stays the same and people can always find your site. Expert Team Maintaining Hardware – The experts at these web hosts constantly maintain the hardware and have replacement parts on hand. They also have redundant hardware and back up your files for you. Next: Step 1 Complete: Level Up! Hosty has earned a Cookie. This item makes Hosty happy and gets him back on track when a technical difficulty arises. A cookie, in relation to the Internet, is a small piece of data sent from a website and stored in a user’s web browser while the user is browsing that website. Continue To: What's My First Step? Learn the key decisions you'll make in starting a hosting account. The first step to getting hosting is to choose the type of hosting you need. Sounds easy enough, right? In reality, there are several things you must know before you start that process. One of these should be sufficient for any size of website you are interested in hosting. Usually, it will be pretty clear to you which one you will need. We’ll cover examples of the types of sites that use all three. The three types of hosting that are generally available are: Shared, Dedicated, and Virtual Private Servers (VPS). These three options combine to cover small, medium, and large websites. Usually, a website size can be determined by the number of monthly visitors. Don’t be afraid to fall in the small section, as 99.9 percent of websites are considered small and it is significantly cheaper! Shared hosting is by far the most common option for small businesses, individuals, and even some popular websites. Shared hosting is many websites hosting on a single server (remember server just means computer). The advantage to using shared hosting is it makes it extremely cheap because of the shared resources (see pricing). Shared hosts can handle websites that run WordPress, Joomla, or others and also make this process very easy to set up. A shared host can handle up to 30,000 visitors per month, which covers most websites. If you are just getting started with hosting, you should take a close look at shared hosting for its value and performance. Dedicated hosting consists of a single server that hosts a single website. The perk to having a dedicated server is that the entire computer is focused on giving your website the best possible performance. While dedicated hosting can be somewhat expensive (see pricing), it is worth the cost if your website demands very fast page-load times, a dedicated IP, and the means to handle a lot of traffic, like upwards of 100,000 visitors per month. VPS hosting is the most difficult to describe out of the three types of hosting. First, VPS stands for “Virtual Private Server.” Basically, a VPS has a huge amount of computing resources you can purchase a portion of for a price. Imagine a computer with thousands of processors, terabytes of RAM, and unlimited hard drive space. For a monthly price, you can reserve as much of that computer as you need (see pricing). What is really happening is hundreds of computers are networked together and appear as a single resource. The advantage of VPS hosting is you can scale from small to large websites without having to switch servers. Also, with a VPS you have a huge number of options as far as software and hardware go, and you usually pay by the hour instead of having a monthly fee. Next: Which Hosting Type Do I Need? Next: Step 2 Complete: Level Up! Hosty has learned the Uptime ability. Hosty will now have a boost to his performance and will keep running for a longer time. Uptime is the amount of time (in a percentage) that a server has stayed up and running. It is a measure of how good a hosting provider is at keeping their systems up and running. Learn the basics for starting up a new website. Finding the right domain name is obviously a very important step in launching your new website. While not directly tied to hosting, there is an obvious connection people make between your website and your domain name. We have a lot of experience with these sorts of issues, so we will try to explain what goes into a great domain name. Use a .COM! 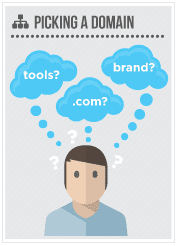 A majority of people still, and probably always will, assume the .com portion of a domain name. When someone sees your results in the search engines, there is also an inherent trust given to a .com. Imagine you’re searching online and you see mywebstore.com and mywebstore.net. Which would you choose to click on first? Avoid trademarks. Including someone’s trademark or even being close can be an extremely dangerous domain on the Web. If you are making an Apple review site, it might be tempting to use something like iPhoneReviews.com, but you will find if your site becomes at all popular, you will be facing legal charges. It’s best to avoid this altogether. A “brandable” domain name is a clever or unique word (or made-up word) that can be stuck in someone’s head or is different enough to make an impression. For example, let’s say you were making a website about a great new toilet paper you designed. In our example, assuming this didn’t already exist, a great brandable name might be Charmin.com. This has the advantage of being short, it “feels” soft and importantly is most likely available for registration. In general, you want to keep your brandable domains as short as possible and reasonably like a word. A domain like yytb.com while short is not very brandable compared to something like papr.com. Yes, this is obviously extreme but you see what we are getting at. A “discoverable” domain refers to one that is keyword rich. For our previous example of toilet paper, a great discoverable domain would be toiletpaper.com. These types of domains are easy to remember, rank extremely well in the search engines, and also give you an instant idea of the content of the site. Of course, there are downsides to this approach. For one, a keyword-rich domain name is often very expensive to purchase. Also, these types of domains sometimes feel very generic and it can make them tough to market. However, this is not always the case. There are some useful tools that exist to help you find a domain name. We will briefly mention some of them below. There really is only one tool you need to know about for keyword analysis and it is Google’s Keyword Tool (which is wrapped into its AdWords tool now). This will give you the number of searches for a certain phrase per month, which is very important to tell you the size of a discoverable domains market. Check out some of these domain name generators to help you come up with ideas for your name. The following sites have auctions on domain names that are already registered and may even have a site on them. If you find your domain is not available, you can a lot of the time find it on one of these sites. Next: Step 3 Complete: Level Up! Hosty has learned the ability Cloudburst. He can send enemies into the air with a burst of clouds, stars, and dust! Cloud bursting is an action used in hosting when you run out of computing resources in your internal data center. You “burst” the additional workload to an external cloud on an on-demand basis. Learn how to get the best hosting deal for your needs. There are many factors that go into our review process that we will discuss in more detail below. 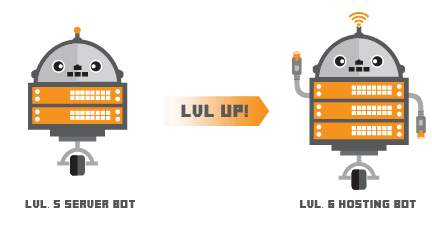 We take into account each hosting type, their allowed traffic levels, how much storage is provided (and its speed), the processing power of the CPUs, their uptime, quality of service, and their customer support. We individually test all of these factors to determine what the best web host is in each category. Our goal is to provide the best free and honest advice about web hosting we can. In the following sections, we will discuss each of the aforementioned factors in more detail and give you an idea of what we specifically look for when choosing a host. 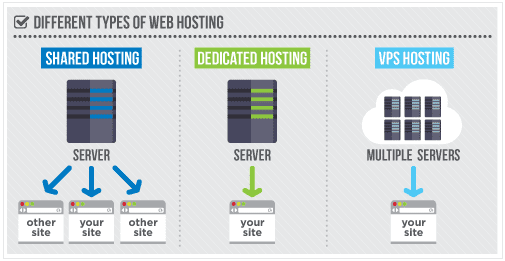 The type of hosting plays a large role in the evaluation of a web host. One host may have excellent shared hosting and terrible VPS hosting, or the other way around. Sometimes hosts focus on being great at something like WordPress hosting, but could care less about their shared hosting customers. 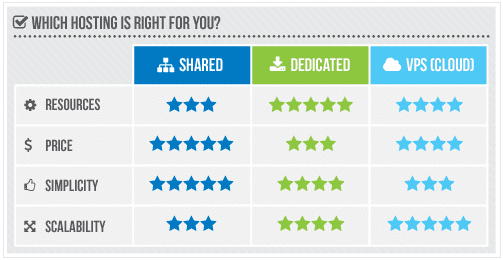 We rate each hosting service by each of its hosting types individually, not in aggregate. You’ll want to spend some time determining which type of hosting you’ll need for your site. Again, we highly recommend you read up on our Types of Hosting section to help make that determination. If you feel like you’re ready to go, great! We’ve done the leg work for you in determining the best hosting deals for each type of hosting. The bandwidth (or traffic) allowed by a web hosting plan refers to the amount of content sent from your server to a client’s browser. It’s a good idea to calculate the minimum bandwidth you’ll need before signing up for a hosting plan. Keep in mind, you’ll want to choose a plan that exceeds your minimum bandwidth needs just in case your traffic grows beyond its current levels. Storage refers to the amount of content, data, and files you can store on your server. Usually, websites do not have a tremendous amount of storage needs, but if you are hosting video or large images or user information, you may find this to be a concern. We do recommend having a minimum of 20 gigabytes (GB) of storage available for your web server. Also, there are two different types of hard drives used these days. The standard hard drives are usually just referred to as say, “20GB Storage.” The other type of hard drive is referred to as an SSD, which stands for solid state drive. These drives are typically faster than standard hard drives and you may see them listed as “20GB SSD”. In addition, as you get to more and more complicated hosting, there are multiple options for hard drive configurations. These configurations have to do with making sure a single hard drive failure does not compromise your system and/or to increase the read and write speed of the drive. As a brief introduction, there is a technology referred to as RAID (redundant array of inexpensive disks) that groups many hard drives into one logical drive. Below we have outlined some popular configurations you might see. Don’t worry if you don’t understand this. It makes very little difference for choosing a web host. We just want you to be aware of these terms in case you see them. 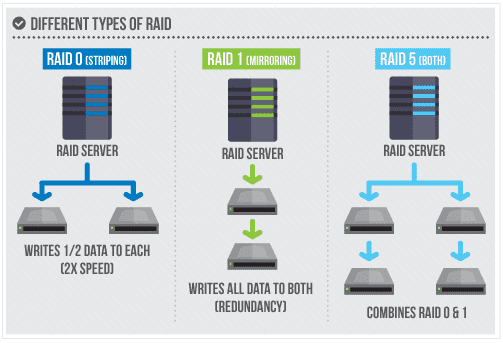 This is sort of a combination of RAID 0 and RAID 1. Three or more drives are basically used to both increase the write speed and mirror the drives. Usually, you’ll come across RAID 5 used in production. There are other types of RAID available. We encourage you to research this further if you are interested. Processing power can be a determining factor in choosing a web host, especially if you are looking at dedicated or VPS hosting. Usually, web hosts will list the number of cores, or CPUs, that are available for each level of service. In general, the more cores that run at higher speeds, the better. That wasn’t too complicated, was it? Let’s continue on! Uptime is a very important issue to a lot of websites, and less of an issue to others. For example, Google needs a near 100% uptime. If Google ever went down, there would be not only a huge loss of search traffic, but there would also a huge loss of revenue for Google. On the other hand, our blog about cute puppies could go down for an hour a month, and it would have virtually no effect on me (in fact, some people might cheer). You need to determine the level of uptime that is acceptable for you. In many cases, 99.9% uptime is acceptable, sometimes 99.99% is acceptable and sometimes 100% is imperative. Most hosts list their uptime as a percentage like this. 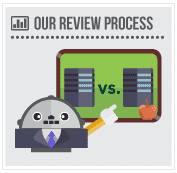 Our hosting reviews will include uptime for each host anytime we can get our hands on a firm number. For obvious reasons, customer service is a very important factor in every product, but especially in web hosting. When you have trouble with your host, you want to be able to contact them and get an intelligible response in a timely manner. You may want 24/7 US-based support or you may be OK with an email response within 24 hours. You will need to determine this for yourself. Clearly, you don’t want to work with the latter option. Next: Step 4 Complete: Level Up! Continue To: What is a Nameserver? Learn some options you'll have in setting up your server. Domain Name System (DNS) is a protocol for how computers exchange data over the Internet. Its basic job is to turn a user-friendly domain name like hostingadvice.com into an Internet Protocol (IP) address like 23.253.70.72. With us so far? Good! IP addresses are what computers use to identify each other on the network. Think of it like using a phone number to connect with a specific person you are trying to reach. It would be very difficult for us to remember the IP address of every website we wished to access. Instead, our request is routed through a DNS server, also known as a name server. The DNS server manages a massive database of records that map the user-friendly domain we type into a web browser with its corresponding IP address. How to enter these DNS records depends on your hosting provider. They should have documentation on how to accomplish what you need with their interface. Address (A) records connect a domain name to its numerical IP address. These are the most important records by far. Without an A record, your website domain name cannot be converted into an IP address and that’s the ballgame. You probably would also like the www version of your domain to be an A record. Important note: Some web hosts require you to put a period after the hostname. Canonical Name (CNAME) records allow a server to be known by one or more hostnames. They effectively act as aliases for the domain set up in the A record. In other words, they will redirect certain domain names to other ones. Using CNAME, you can point multiple other hostnames to the A record address. As an aside, web folks love to use this word canonical, which basically means “the actual one” or pointing at “the real one.” In this case, a canonical name of ftp.hostingadvice.com is simply hostingadvice.com. (Those silly web folks). You may enter unlimited servers to try. The “10” and “20” in the above example are the records MX Priority. This determines the order in which to try the servers. The server with the lowest MX Priority is tried first. If that server fails to respond, the server with the next lowest MX Priority is tried and so on. Luckily, our mail providers usually tell us exactly what should be put here. If you are using a service similar to Gmail, then they will explicitly tell you what to enter. The time to live (TTL) is technically the lifetime of cached data on a DNS server. However, for our purposes, the TTL is the amount of time it will take for our nameserver changes (measured in seconds) to take effect. For example, if we wanted to add an Address (A) record to our DNS records and we had a TTL of 86400, that would mean it would take up to 24 hours for our Address record to show up. Usually, the TTL can be lowered before you add a record and that will help it propagate faster. A lot of DNS services restrict the minimum TTL you can set to reduce their server load. Next: Step 5 Complete: Level Up! Hosty has learned a new ability: Firewall. He can create a wall of fire and flying embers to engulf the fiercest of enemies. A firewall allows or blocks traffic into and out of a private network or the user’s computer. Firewalls are widely used to give users secure access and to detect outbound traffic, guarding against spyware. Learn about the software behind your web hosting. Most web hosts will give a choice between a Linux server and a Windows server. The type of server you need depends on what kind of development language or database you plan to use with your website. The operating system you use on your home computer will have no bearing whatsoever on which kind of server you should use. Even though it may seem counterintuitive, there is a 99.9% chance you should use LINUX hosting. Windows hosting needs are very rare and you should only choose this option if you have a very specific reason to do so. Don’t worry, you won’t have to use the command line if you don’t want to with Linux. Most hosting plans come with great user interfaces that will take care of all of the hard parts for you. Linux hosting is the de facto operating system for web hosting. If you plan to use PHP, Python, Ruby, or MYSQL in your website, Linux is the solution for you. When looking for ready-to-use software to power your website, like blogging platforms, content management systems, message boards, eCommerce tools, et cetera, many free, open-source, and industry-standard choices are available for Linux; meanwhile similar software for Windows hosting is more likely to be based on licensed sources for which you must pay. Linux may sound intimidating to most users accustomed to using Windows on their home computers. The vast majority of users’ interactions with the web server will be done with FTP programs or web interfaces that will require no Linux administration knowledge and will be virtually identical with a Linux compared to a Windows host. Everybody loves Windows, right? (OK, maybe not). You should only choose a Windows host if you plan to use ASP or ASP.NET on your site. Otherwise, the more popular and affordable Linux option is probably best for you. Web hosting control panels provide a graphical user interface and a suite of automation tools designed to make complex web hosting tasks simple. Control panels streamline useful processes, such as creating databases, managing website files, setting up email, and managing DNS. The majority of web hosting plans will include access to a web hosting control panel. The two most popular choices for web panels are cPanel and Plesk. They both offer very similar functionality; however, they are organized differently, have a different security model, and use slightly different terminology. Generally, cPanel is better for Linux servers while Plesk is better for Windows. While they have their slight differences, the choice between cPanel and Plesk should not be too huge of a factor in choosing a web host. They both will provide a useful and functional interface for administering your website. Next: Step 6 Complete: Congrats! Way to go! You’ve successfully completed our Basics of Hosting guide. Now that Hosty is a fully-developed Hosting Bot, he (and future Hostys to come) can now provide sound web hosting so everyone can view reliable and enjoyable web content. Yay Hosty!